Curcumin 95 is an 18:1 extract of the antioxidants found in the spice turmeric root. Curcumin 95 contain 95% curcuminoids (including curcumin, demethoxycurcumin and bisdemethoxycurcumin) which are antioxidants. Specifically, curcumin and its derivatives protect DNA against oxidative damage induced by singlet oxygen. Turmeric is Latin is Curcuma longa. The roots of the plant are stemlike and are used as an herb in Asian cooking such as curries. Take 1-5 capsules per day, with food, or as directed by your qualified healthcare consultant. Other Ingredients: Cellulose, silicon and magnesium stearate. Capsule consists of gelatin. Contains NO common allergens. 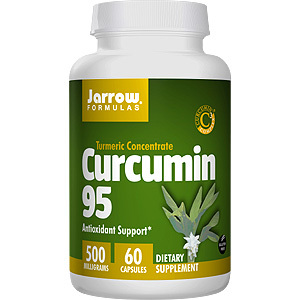 Curcumin 95 - is shipped in a discrete, unmarked package. Orders are processed immediately and usually take about 3 to 5 working days to be received. We do ask that you try it for 2 to 3 weeks to feel the full effects. Any information received is used only for order processing and shipping purposes. Your information, such as e-mail address, will never be disclosed to a third party.